I’ve had the winter blues and cabin fever. Last week, winter revisited us without an invitation! We got about 8 inches of snow. Needless to say, I was an unhappy camper. Morgan was excited about it, and I think our dog, George enjoyed it, too. Here are a few pictures of the fun in the snow. Our daughter being pulled on the redneck sled by the neighbors kid. George having a taste of snow. George likes the snow. George approved this message! Snow. In March. Where is the green grass? Well folks, another March with snow in Northeast Arkansas. I do not approve! Presently it’s warmer, but gloomy and rainy. Ugh. I’m ready for spring. Vegetables and flower gardens. Mowing the yard. Enjoying coffee on the front porch while listening to the birds sing. What do you like about spring? Maybe it’s not too cold for some, but for me, it’s absolutely freezing! The high today was in the mid twenties. Tonight it’s going to be a whopping 9 degrees! Yikes! Morgan is still battling sinus gunk and has a low grade temperature. Still whining about not getting to go outside. And still whining about a new site for her bow. Poor, tortured soul! Thankfully, her target is still set up in the man cave and can shoot her bow from the living room down into the target in there. Still complaining about “the going outside where she can shoot farther back.” You see, her grand idea of standing on the platform of the stairs was shot down by mean ol’ momma aka me. I will say this, she was very passionate with her argument and made great points. But, as always, mom wins out. She’ll be better soon and can go out and shoot then. As for the new site for her bow, she really doesn’t know which to get. She has been on every social network and bow websites researching and asking. Still not sure what she wants. Suggestions? Anyone? She’s got two bows, one for hunting (Diamond) and one for competitions (Elite). Her competition bow is the one in need of a new site. Never mind the fact she got this bow and all the amenities back last June for her birthday. Ah, the spoiled girl. Very. Spoiled. Another day in the archery range, er, the man cave! As I mentioned late last night, we were under a winter weather advisory here in Northeast Arkansas. It sleeted more than it snowed. Believe it or not, it was 65 degrees Saturday while we were delivering flowers. Crazy weather here-warm one day, freezing the next. I think we made it to a whopping 25 degrees today. Unfortunately, Morgan is coming down with a cold and could not go out to shoot her bow. So, what does dear ol’ dad do for his die-hard archer girl? Bring her target inside and set it up in his man cave! 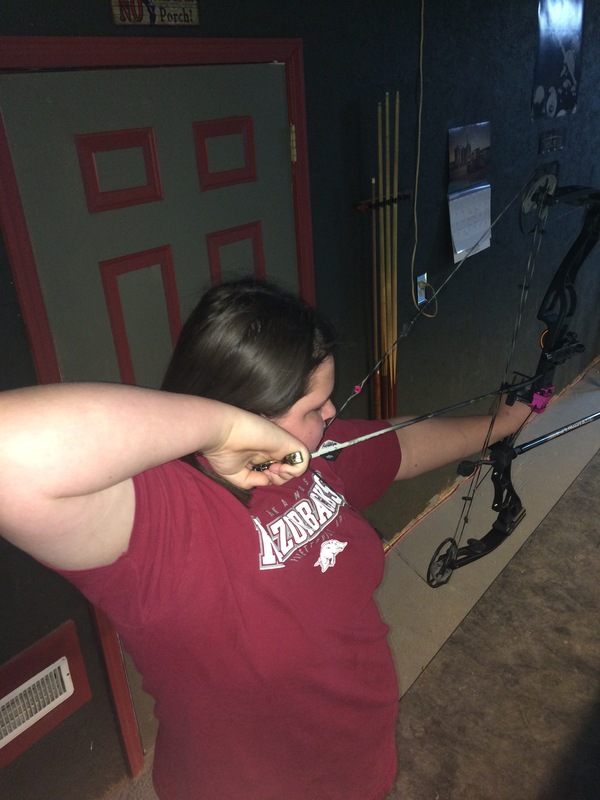 She opened up the door to the man cave and shot her bow in the living room. How redneck are we? I did go outside for a few snapshots while the snow was falling. Brr! It was cold out today! I personally think the pines are simply gorgeous with snow. My magnolia looks lovely, too, but lonely. Probably because it’s the only one I’ve got! 😜 My quaint, yellow “Addams Family” bench looks really blah. I know, I need to repaint it. That will be a spring project, and frankly, I’m still mulling over what color I want to paint it this year. It’s been dark green and now yellow. I’m thinking a baby blue might be the color, or a bold and bright cherry red! Yes, I repaint some, not all of my lawn furniture and decor every year. I’m crazy like that! Well, here’s to staying warm and praying for spring to make its debut soon. Very. Soon. 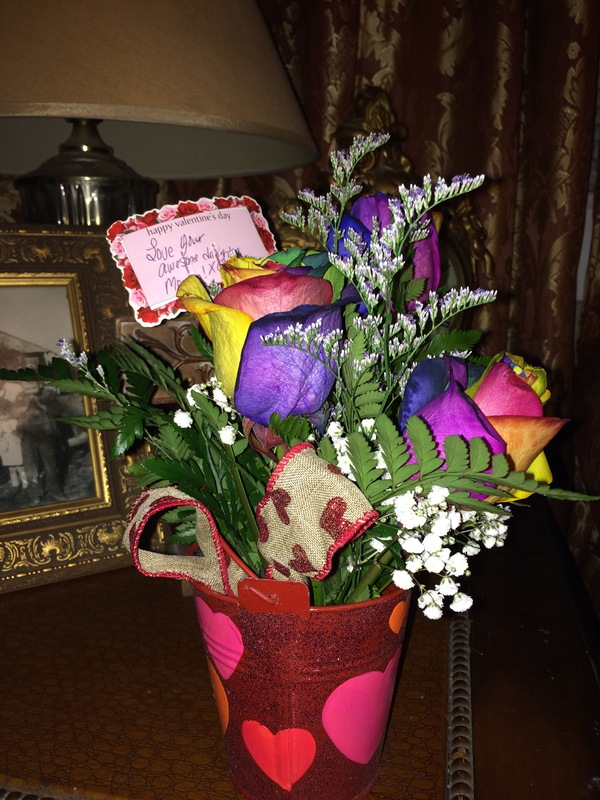 For the past couple of years, I’ve helped a friend who owns a flower shop here in town, deliver flowers on Valentine’s Day. It’s always busy, but fun. This year, Morgan was my faithful sidekick. With our list of “unknowing” receivers’ addresses, and the back seat of my truck filled with oodles of arrangements, we spent all day Friday and Saturday morning delivering to young and old, male and female. Lots of smiles and tons of “thank you so much!” I guess the highlight of my two days of working, was when my daughter presented me with a beautiful arrangement of my own! Aren’t they just beautiful? Tye-dyed roses! Who would’ve “thunk” of that!? Morgan was so sweet to do that! And to top of her sweetness, she got our next door neighbor yellow roses. My daughter amazes me with her kindness and generosity. To top off our hard work, the hubs took his two Valentines to a local Mexican restaurant for dinner. Yay! No cooking or dirty dishes for this wife and mom!